When a friend innocently asked me for my chili recipe I froze, then I panicked. Then I lied. That was simply boneheaded and I apologize. There is no secret to this chili, just a mystery. A mystery because I have been making it for so long that I hardly think about what goes in it. And, more importantly, I have been making it in increasingly larger batches – moving up from a four-quart slow-cooker to my feed-the-crew-of-a-warship-sized stock pot (24 quarts) – and my brain and math don’t get along. Reducing the vast quantities of ingredients I use down to something manageable for sane cooks is a challenge. Don’t ask me why but I’ve always started my chili like a gumbo with the “holy trinity” of onions, celery and green bell peppers. A little beer gives it body and lots of spice gives it zip. I’ve often made it with canned beans, but I prefer to cook my own (less recycling and none of that goopy liquid that has to be rinsed off). This chili has become a staple around our house – I freeze it in two-cup containers because my son will take it for lunch and it’s the few ways I can get tomatoes and legumes into him. Make it in big batches like I do and you’ll be all set if a division of marines stops by for lunch. Heat a deep pan on medium high heat, add the oil and sauté the onions, celery and green pepper until the onions are translucent. (Add the garlic for the last minute or so). Add the beef and cook until browned. Add the spices and oregano and stir to coat beef and vegetables. Add the beer (if using, a little water if not), a splash of vinegar, tomatoes and cooked (or canned) beans. Break up the tomatoes a bit with your spoon. Season to taste with salt and pepper. Simmer for an hour or so until flavours have melded and chili is thickened a little. Garnish with cheese and cilantro (if desired) and serve with crusty bread. This entry was posted in Main Courses, Soups and Stews. Bookmark the permalink. 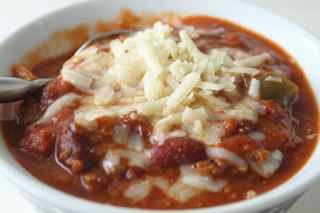 Havent made a chili in a long time and makes me want to! Every tried baker’s chocolate in it? Gives a richness that’s devine but be parsimonious as too much makes it bitter. Thanks, Liam. I haven’t tried chocolate but I can imagine how a little might help. I’ll try that in the next batch. Thanks for the tip!